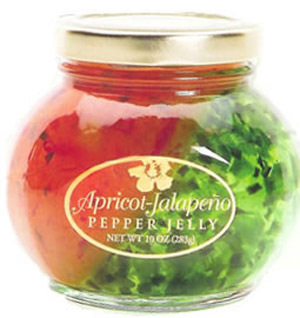 Apricot Jalapeno Pepper Jelly - Apricot jalapeno pepper jelly adds sparkle to everyday foods. A golden sweet, tart pepper jelly with bits of apricot, red bell & jalapeno pepper. Not just for your morning toast or bagels with cream cheese,apricot pepper jelly makes a delicious glaze for pork , poultry, & seafood. The possibilities are endless! Aloha From Oregon Apricot-Jalapeno Pepper Jelly.